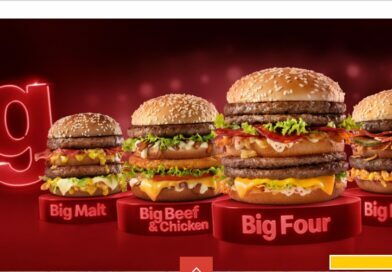 McDonald's Nevada Grande - Burger Price, Review, Calories & More! 100% beef patty, chilli mayo, crispy onions, shredded lettuce, cheese and a sweet tomato sauce, all served in a chilli-topped lattice bun. 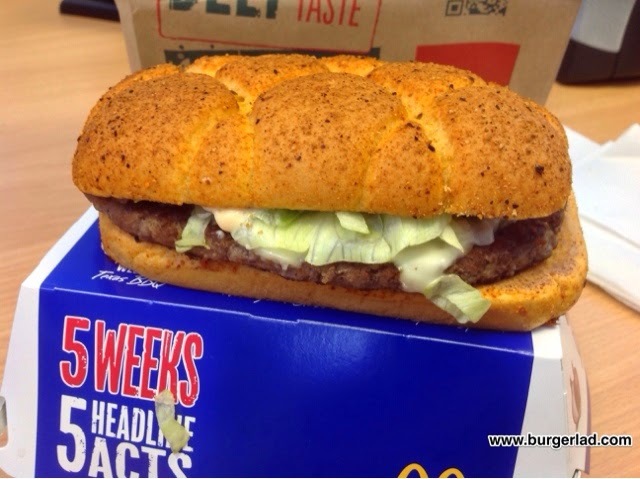 Burger Lad® is back on day one of week two for the Great Tastes of America 2014 Nevada Grande burger from McDonald’s. Once again, we hit the McDrive at 11:30 on the dot and this time it was more deserted than the Nevada desert. I suspected I would have to wait for this to be made-up from scratch and this was confirmed when one of the crew members said it was going to take a couple of minutes. Good. In the end it did take a whole five minutes from order to being snatched away in my grasp. But did I care? Of course I didn’t as I knew there would be no “Burger Slide” on the Nevada Grande. Just as some tumbleweed blew past the “FatMobile” I was off and managed to get back to the office within a record ten minutes. I did try and do some research on the cuisine of Nevada but came up pretty empty handed so if anyone can provide further insight please leave a comment below. 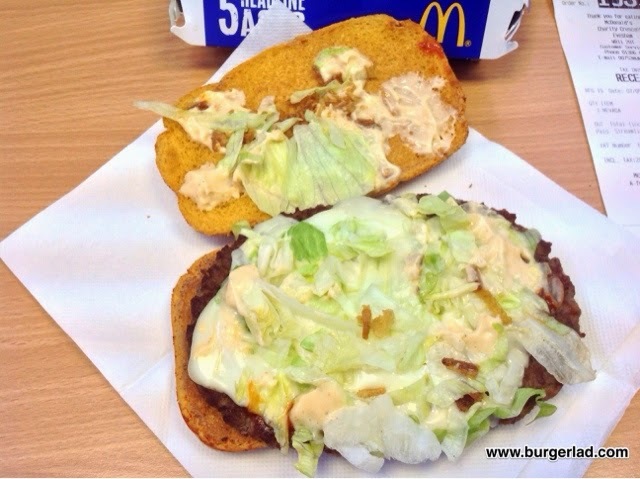 The smell coming from the promotional box got the senses going and I wondered if the heat of the Nevada desert and the chilli mayo and topped bun was the tenuous link for this latest limited time offering from McDonald’s. As you can see from the pictures, it had been constructed fairly respectably. We did the usual photo shoot and filmed the latest episode of BLTV which you can see below. I was so excited during the video I couldn’t get my words out. 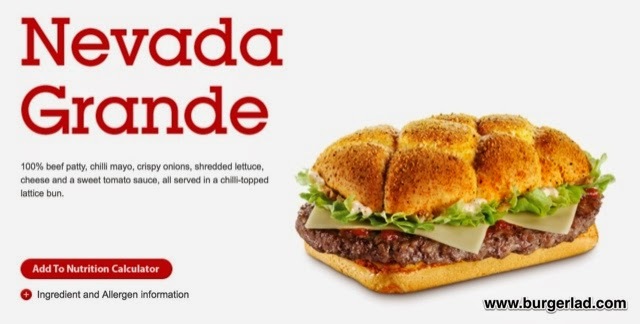 On initial taste, it doesn’t seem too hot/spicy but to be fair to the Nevada Grande by the end of it you’ve definitely got a warm glow going on inside your gob. Even our Production Assistant, Double B was tempted by this burger and that really is saying something! 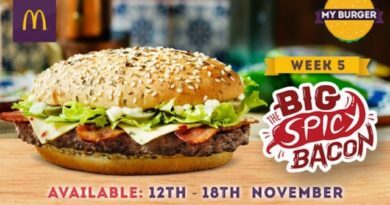 The combination of the chilli mayo and sweet tomato sauce really works for this promotional patty. 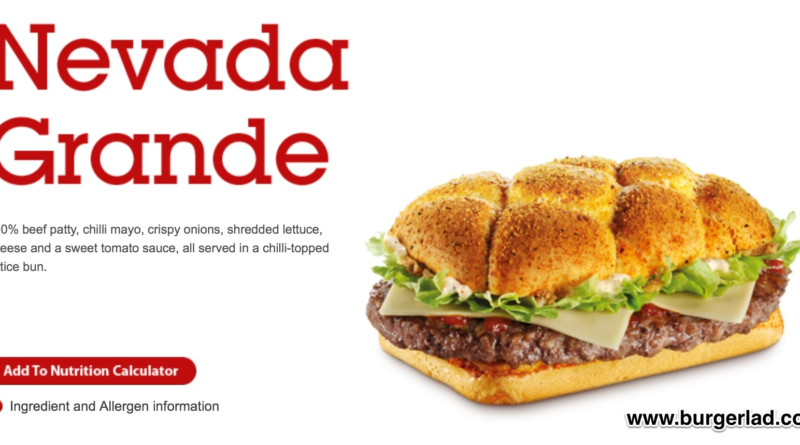 I was surprised at the heat level of the Nevada Grande – it’s not a silly heat but it is certainly one of the spiciest and dare I say best promotional burgers I’ve ever had from the Golden Arches….? I was looking forward to the crispy onions as they are one of my favourite burger toppings of all time and a staple on my own creation, the PFT. In the video, I unfairly describe them as “dull”. 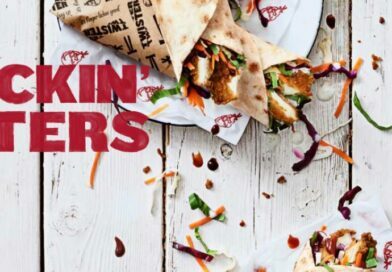 What I meant by that is I find they have a more mellow taste than the sharpness of fresh white or red onion and they complimented the beef and other toppings. I enjoyed this so much I could quite easily eat a few more before this latest LTO disappears. 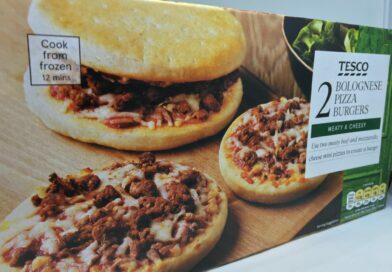 But, at 725 calories eating more than one of these in the week it is available could lead to “Very Bad Things”. 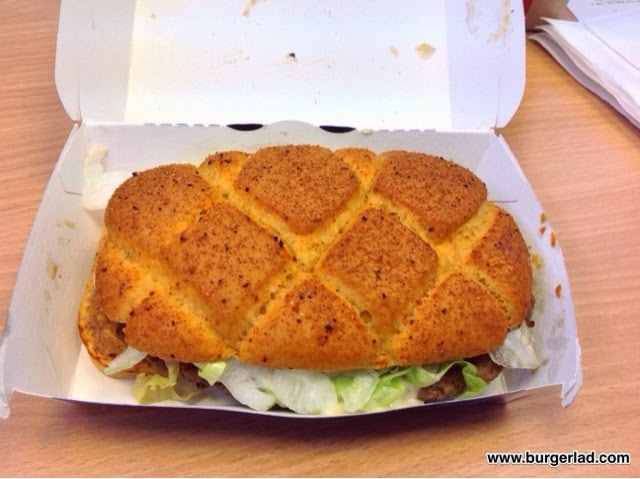 We’ve not mentioned the bun and/or cheese so far in this “review”. 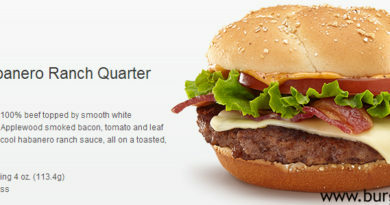 The bun was soft, fresh and had a marginal spice to it, definitely one of the better ones I’ve had recently from McD’s. 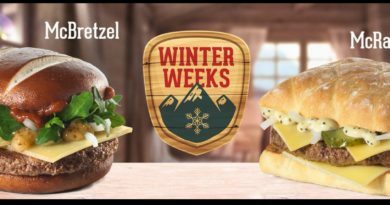 I was pleased to see the white cheese they are using for the GTOA promotion and it gives me hope that we might see something like the Grilled Onion Cheddar Burger (USA) appearing on the Saver Menu someday. Possibly. We would have loved to have got this published sooner claiming it to be the “first review” blah blah but really!? Is there any other place you need to check to see the definitive guide to High Street burgers…!? Overall, this was a very commendable addition to the line-up and certainly gets the Burger Lad® seal of approval. A surprisingly spicy burger which works nicely with the combination of the sauces and the crispy onions. With that, let us take one last look at the Great Tastes of America Nevada Grande. We’ll be back for week three when we savour the flavour of the Texas BBQ. 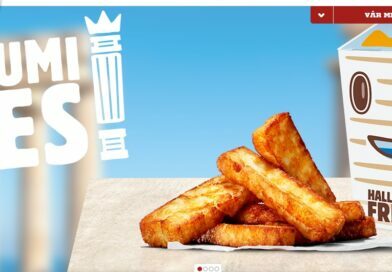 The great thing about the Tastes of America promotion is that you get the crisscut fries which are vastly better than McD's usual soggy half-cooked efforts. I have to say I disagree with #Curmudgeon on the fries. MCDonalds fries are usually their saving grace but on this occasion the burger was exceptional. 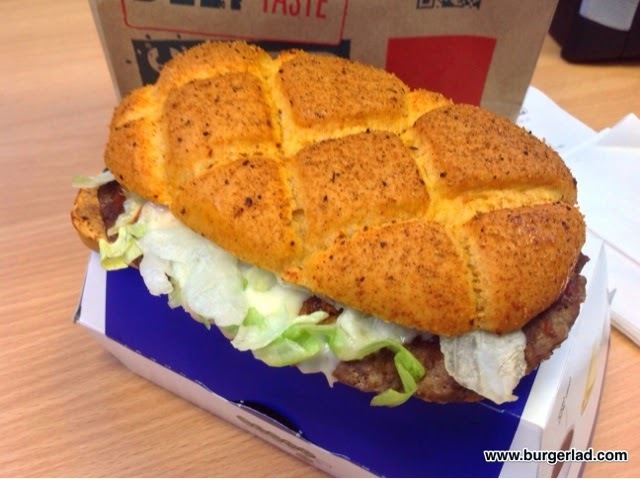 Fantastic non-slide build coupled with an excellent sprinkling of chilli dust over the bun to give an added 'zing'. Overall I would say the 'crispy onions' were not a prominent feature in the burger but the lettuce provided the necessary texture and crunch. In ratings terms I would give the Nevada Grande a 7/10. 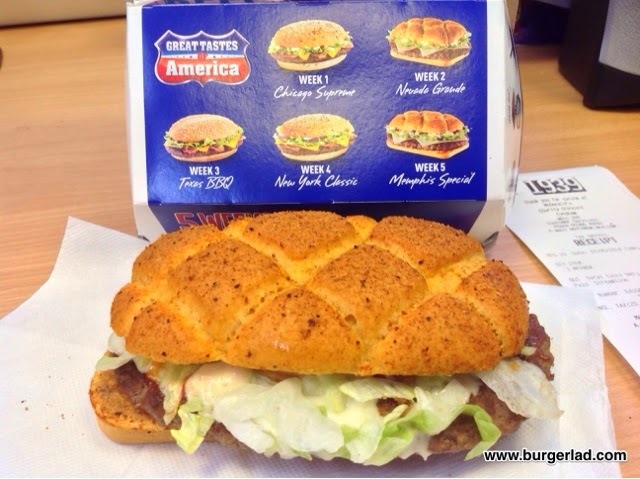 great reviews, any chance of the mcd's america wraps being reviewed?